Reminder: The Greenfield R-IV School District will not be in session, Friday, April 19th, in viewing of Good Friday. We hope everyone enjoys the break and has a happy Easter. 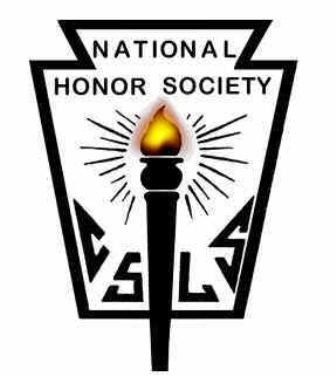 The Greenfield Chapter of the National Honor Society cordially invites you to the annual Induction of New Members, on Tuesday, May 14th, at 7pm. This ceremony will include the bestowal of gold honor cords to the graduating seniors, as well as the installation of next year's officers. A reception will follow in the cafeteria. We hope you can attend. 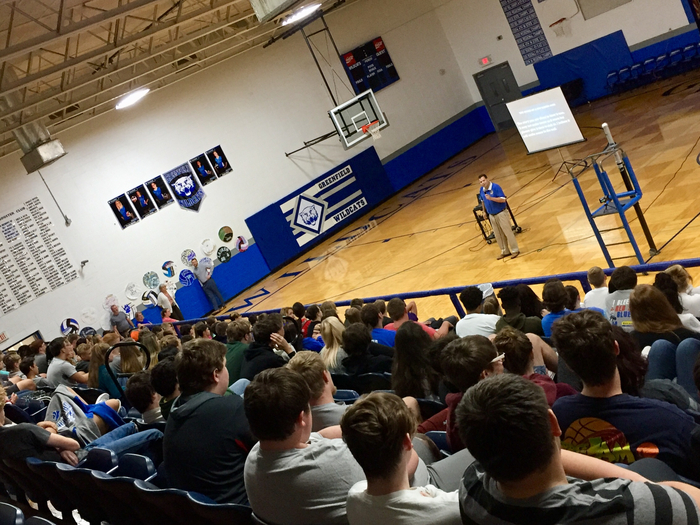 Juvenile Officer Jeremy Ruddick and Chief Tim Larkin were present at the High School this morning. 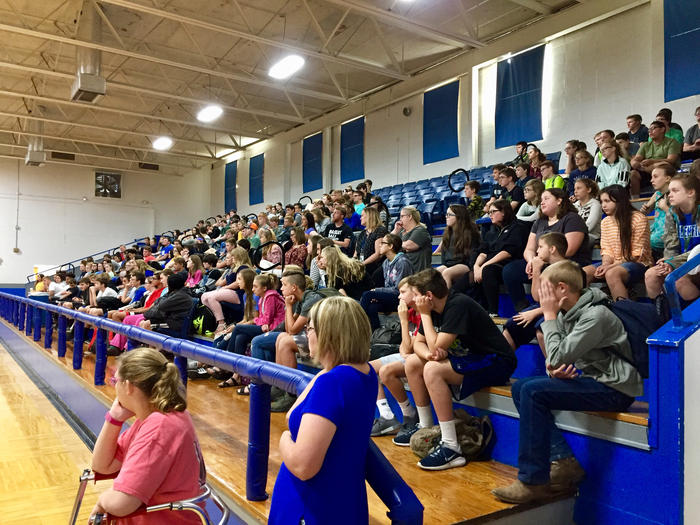 Officer Ruddick and Chief Larkin held a prevention and informational assembly regarding the effects of juuling/vaping, trafficking, social media, and drugs/alcohol. 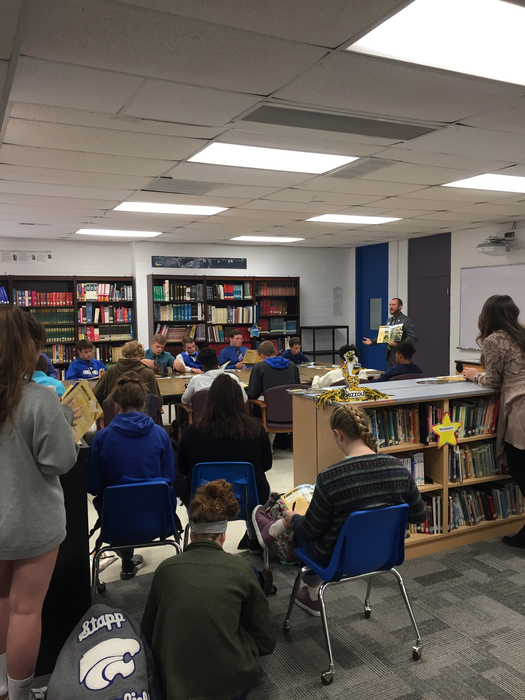 These subjects of concern were openly discussed with grades 7 - 12. In today's society, teens are dealing with a number of pressures and issues that are becoming a prominent encounter of everyday life. The students were very attentive and engaged throughout the assembly. Thank you Officer Ruddick and Chief Larkin for taking the time out of your busy schedules to care about our kids! 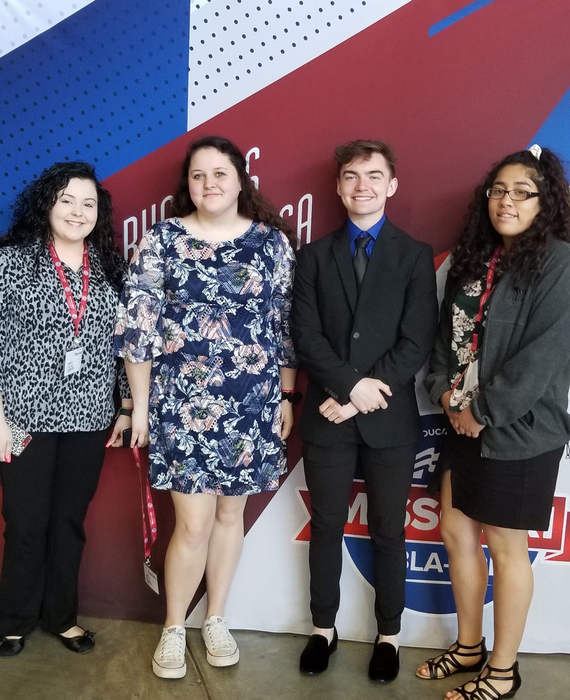 Four High School students qualified for State FBLA competition and have been spending their week enjoying and participating in convention. 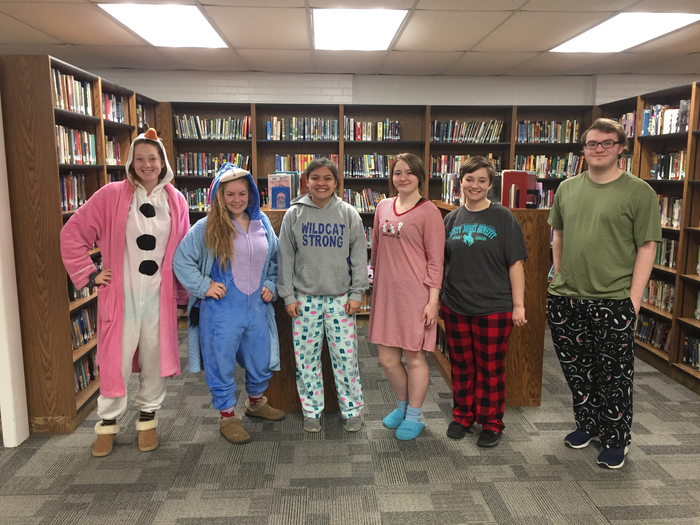 Congratulations to Taylar Morrow, Cassidy Conroy, Blade Welch, Susana Trujillo, and advisor Mrs. Kemp! What a proud representation of our Wildcat students! It's GAME DAY! The schedule is loaded, but we have no complaints on this gorgeous spring day! High School Baseball and Softball will be traveling to Sheldon this evening. Baseball will be playing at 4:30pm with Softball to immediately follow. Both teams will be playing on the baseball field. High School Track will be hitting the road to Pierce City. Meet time: 3:30pm. It's a great day to come support Wildcat athletics! 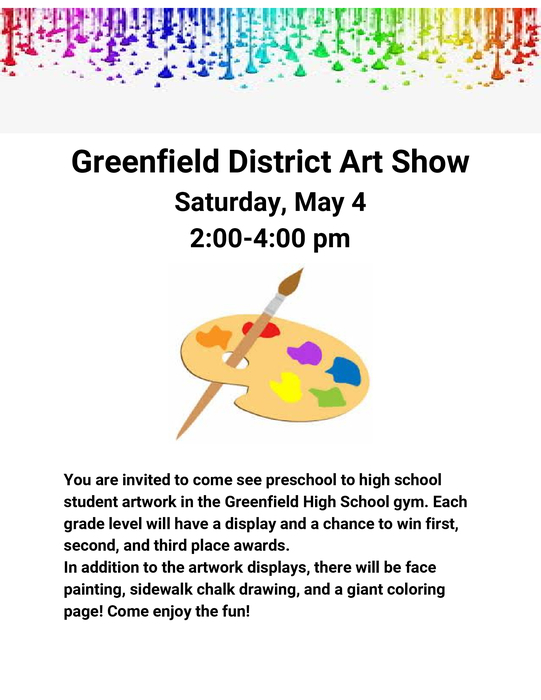 Be sure to SAVE THE DATE for the District Art Show! Works displayed will range from Pre-K entries all the way through High School Seniors. 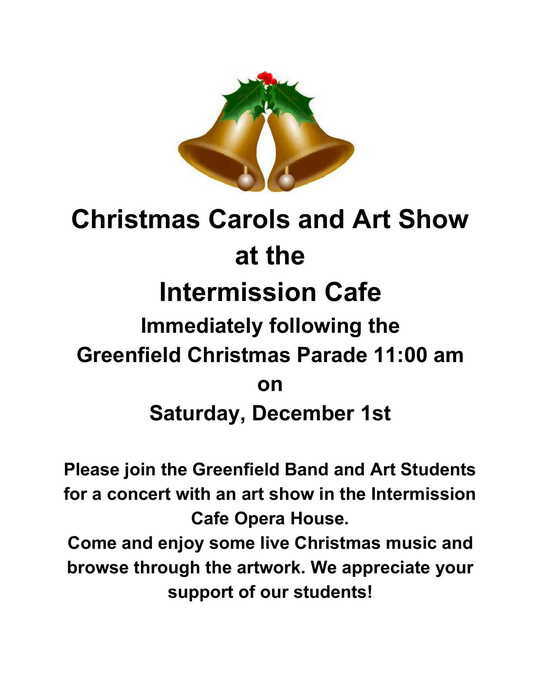 Come enjoy the creativity of our talented Greenfield Wildcats! It's GAME DAY! High School Softball and Baseball will be traveling for this evenings match-ups. Softball will be taking on the Pleasant Hope Pirates. Game time: 4:30pm. Baseball will be facing the Walnut Grove Tigers. Game time: 5:00pm. Good luck athletes and coaches! It's GAME DAY! Wildcat fans, you will have your choice of games to attend on this beautiful spring day! Varsity Softball will be traveling to the Pleasant Hope Tournament where they will be playing in 3 games. 1st game time: 12:30pm. Baseball will be playing host to the Bronaugh Wildcats this evening. Game time: 4:30pm. GO WILDCATS! High School Track will be visiting Spokane for their second meet of the week. Meet time: 4:30pm. GO BIG BLUE! Between now and Tuesday, April 30th, the Greenfield ACTA Yearbook staff will be taking orders for senior recognition ads. 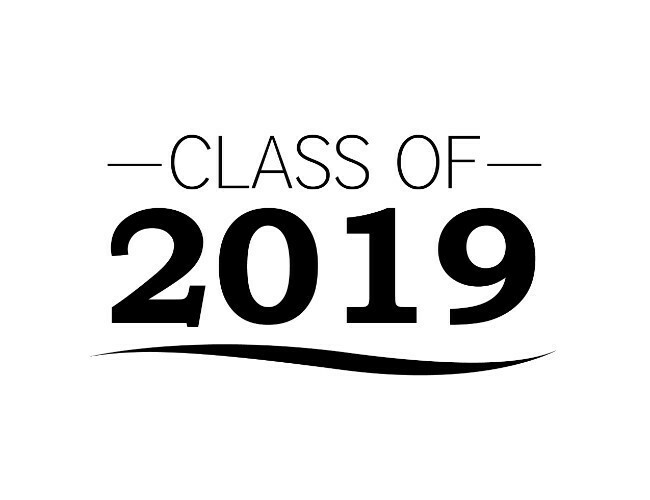 All seniors have received an information packet to take home to their parents, and additional order forms are available at the front office. Honoring your graduate with a space in the yearbook is a great way to send them off. Have questions? 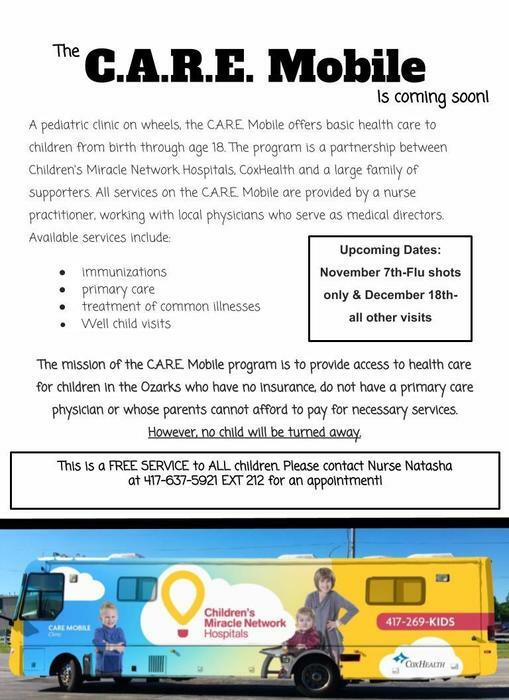 Call Mr. Teel at 417.637.5323. HS Track will be traveling to Skyline today. Meet time: 4:00pm. Good luck athletes and coaches! 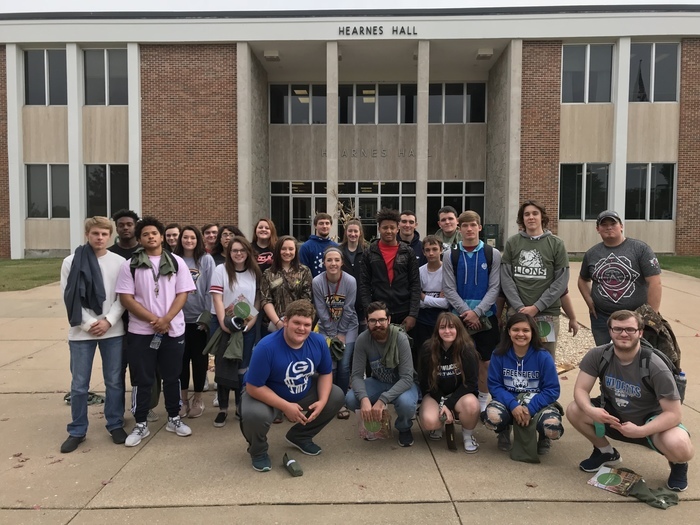 Good Luck to Mrs. Compton and our math students who are competing in the MSU Math Relays today! We know you will do great! It's GAME DAY and Senior Parent Night for Wildcat Softball. The Lady Wildcats will be hosting the Stockton Tigers this evening. Game time: 4:30pm. Senior Parent Night will be held after the varsity game. GO BIG BLUE! Greenfield Wildcat Band will be traveling to Webb City High School today, April 9, to participate in district competition. 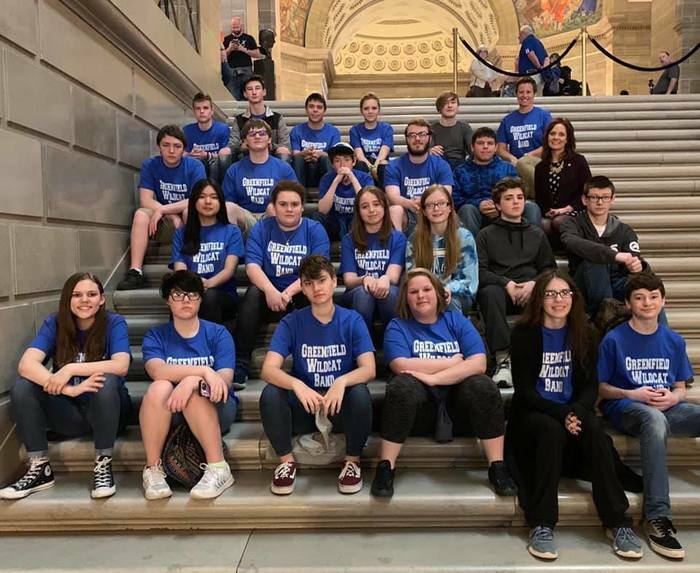 Help us wish Mrs. Dale and our band students, GOOD LUCK! It's GAME DAY! High School Baseball and Softball teams will be traveling to Lockwood to face off with the Tigers this evening. Game Times: 4:30pm. 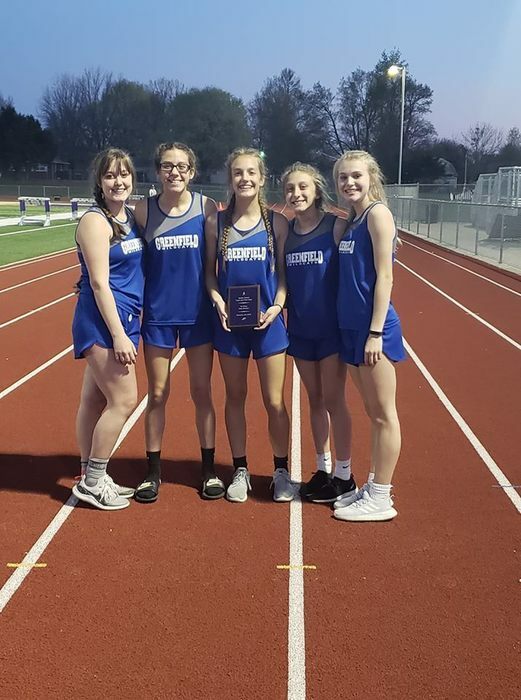 Junior High Track will be traveling to Sarcoxie for their second meet of the season. GO BIG BLUE! 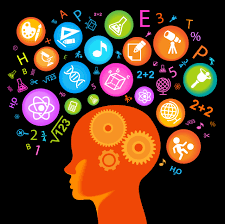 Looking into the weekend, High School Scholar Bowl will be traveling to College Heights tomorrow, April 6th, to compete in Districts. Good luck to our Scholar Team as they embark on a full day of head to head competition while covering questions from all areas of knowledge! It's GAME DAY! High School Softball will be hosting the Bronaugh Wildcats this evening. Game time: 4:30pm. Lets go ladies! Reminder: The Greenfield R-IV School District will release early on Friday, April 5th at 1:00 pm for teacher professional development. Elementary School students will begin releasing at 1:00 pm and JH/HS students will be released once buses arrive from the Elementary School. Congratulations to the High School Choir for receiving a Superior 1 Rating at the Lamar Music Festival! Receiving a 1 rating is comparable to the grade of “A”. This rating reflects the finest conceivable performance for the event and class of participants being evaluated – worthy of the distinction of being recognized as among the very best. 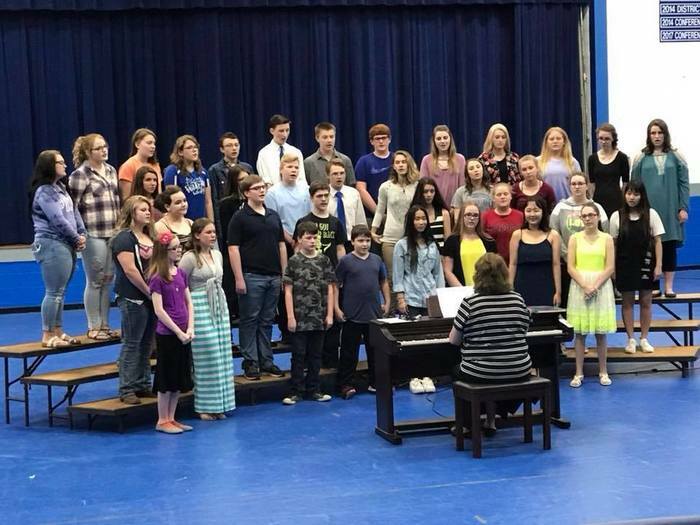 The High School Choir is directed by Mrs. Beeson. Congratulations to all involved! REMINDER: 2019 Spring Picture Day is tomorrow, April 4th. All students will be photographed at this time. Please be sure to wear your best smile! Help us wish our High School Choir students GOOD LUCK as they travel to Lamar this afternoon for the annual Choir Festival. Mrs. Beeson and her students have been diligently preparing for competition and we know they will make the district proud! Good luck to all! TRACK season is here! The High School Track team will be lacing up their running shoes and heading to Stockton for the first meet of the season. Start time: 4:30pm. Come watch our athletes run, throw, and jump their way to success! It's GAME DAY! High School Baseball will be hosting the Marionville Comets this evening. Game time: 4:30pm. Softball will be hitting the road to take on the Hurley Tigers. Game time: 4:30pm. Start your week off right by coming out to cheer on our Wildcat athletes! It's GAME DAY...again! Baseball and Softball teams will be hitting the road this evening to face off with the Jasper Eagles. Game times: 4:30pm. Go Wildcats! It's GAME DAY! Wildcat Baseball and Softball teams will be hosting the Osceola Indians this evening. Game times: 4:30pm. Meet us at the diamond and help cheer on our student athletes! GO BLUE! It's GAME DAY. High School Baseball and Softball will be hosting the Miller Cardinals this evening. Game times: 5:00pm. GO BIG BLUE! It's GAME DAY! High School Softball will be hosting the Morrisville Panthers this evening. Game time: 4:30pm. It's a beautiful day to be out on the diamond, come cheer on our ladies! Greenfield FCCLA is partnering with Community Blood Center of the Ozarks to host a Blood Drive tomorrow, 3/22. The drive is open to the public and will take place from 9am - 2pm in the High School Gymnasium. A free pair of colorful socks will be given to every participant! It's GAME DAY! High School Baseball and Softball teams will be traveling to Golden City this evening to face off with the Eagles. Game time: 4:30pm. Come out and support our student athletes! It's GAME DAY! Wildcat Baseball will be hitting the road early this afternoon. The Wildcats will be headed to Lamar with a game time of 1:00pm. The Lady Wildcat Softball team will be traveling to Sparta this evening to face off with the Trojans. Game time: 4:30pm. GO BIG BLUE! It's GAME DAY! The Lady Wildcat Softball team will be hosting Diamond this evening. Game time: 5:00pm. Get your blue on and come support our student athletes! Reminder, school will be released at 1:00 pm today, Thursday, March 7th for Parent Teacher Conferences. 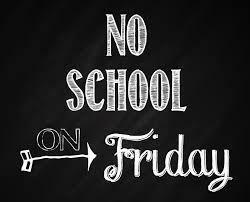 No school Friday, March 8th for Teacher Professional Development and no school next week for Spring Break. Enjoy the time off and see everyone back on Monday, March 18th. The first day of Wildcat Youth Basketball Camp kicked off yesterday and the gym was FULL! If you missed out on day 1, don't worry! Camp will be held through Wednesday, March 6th and new faces are encouraged! Permission waivers can be found in the elementary office! GO BIG BLUE! Wildcat YOUTH Basketball Players, we are looking for you! 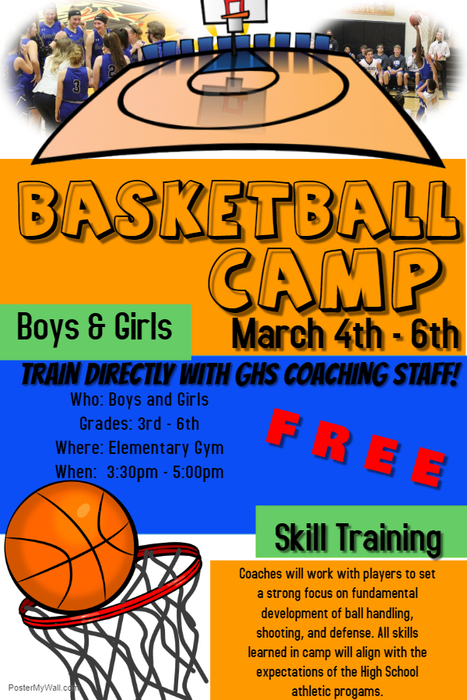 Greenfield High School basketball programs will be teaming up to host a FREE youth camp March 4th - 6th. If you are interesting in getting a jump start on your skills, be sure to join us for 3 days of learning and fun! It's GAME DAY! High School Boys Basketball will be traveling to Marionville tonight for the first round of the District Basketball tournament. They will play at 5:30 pm against the host team, Marionville. The bus will leave at 3:00 pm from the Greenfield High School. It's GAME DAY! High School Boys will be hosting Marionville this evening for Senior Night. Game time: 6:00pm. High School Girls are traveling to Lockwood to face off with the Tigers. Game time: 6:00pm. Pick a game, get your blue on, and come cheer on our student athletes! UPDATE: Courtwarming will be held tomorrow, Tuesday 2/12. 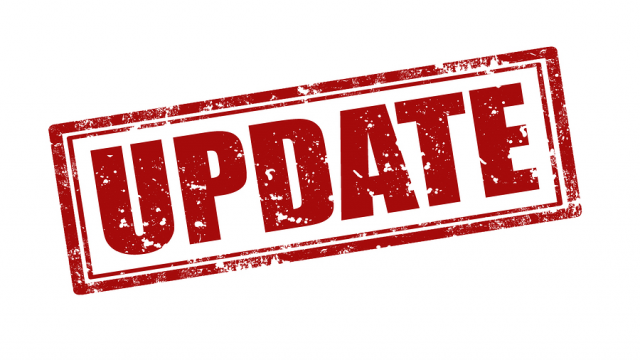 Game and event order are as follows: 5:30pm- Varsity Girls vs. Marionville Halftime of Girls Game- Honoring Boys Academic and Athletic All State and Baseball Quarterfinalist teams. Between Games- Girls Senior Night and Courtwarming Coronation 7:15pm- Boys game vs. Weaubleau Halftime of Boys Game- Honoring Academic and Athletic All State Girls. Due to poor road conditions, COURTWARMING Games & Activities have been CANCELLED this evening, 2/8/19. Games, chili supper, courtwarming, and athlete recognitions are tentatively being rescheduled to Monday or Tuesday of next week. (2/11 or 2/12) Please check back for updates! It's GAME DAY! The High School Boys will be hosting the Walnut Grove Tigers this evening. Get your blue on and come cheer on our student athletes. Game time: 6:00pm. The Greenfield R-IV School District will release early on Friday, February 1st, at 1:00 pm. 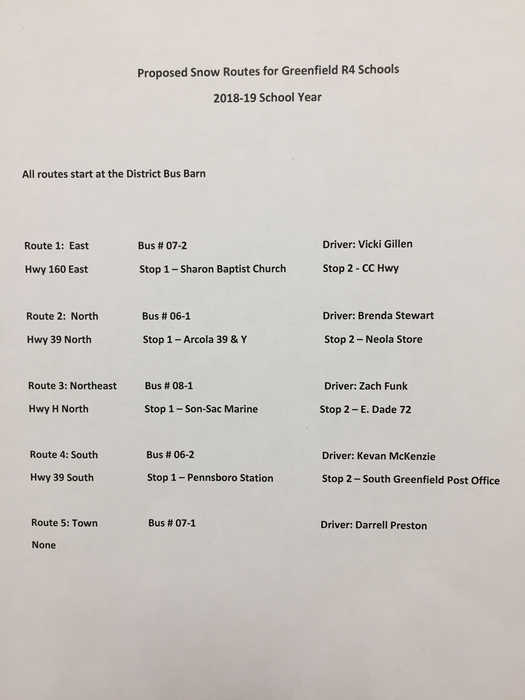 Elementary School students will be released first, followed by JH/HS students once buses arrive from the Elementary School. It's GAME DAY! Varsity Boys and Girls will be on the road this evening to meet up with the Dadeville Bearcats. Varsity Girls will play first followed by Varsity Boys. Game time: 5:30pm. Go Big Blue! 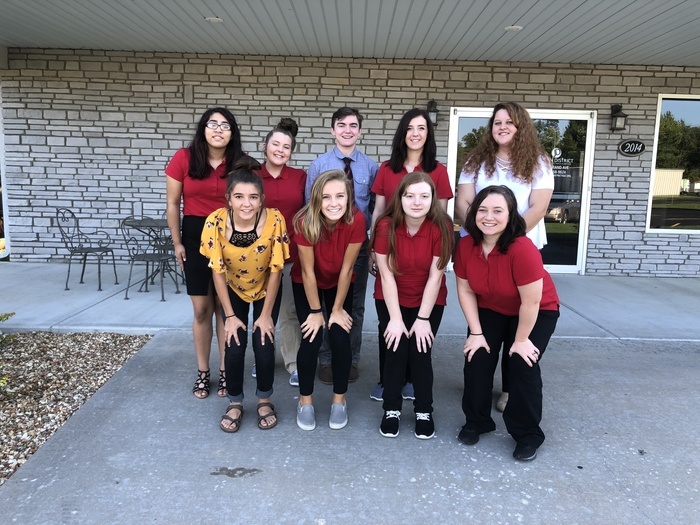 Greenfield FCCLA was proud to have six members participate at the Region 11 STAR Event competition held in Carthage, MO on January 17. Keyton Ipock and Jacob Crouch both received a bronze medal for their Career Investigation Portfolios. Ellee Land received a silver medal for her Career Investigation Portfolio. Nevaeh Garcia, Jasmine Feezell, and Haley Gossett received a silver medal in their category Chapter Service Project Display. Congrats, students! We are very proud of all your hard work! It's GAME DAY! School may be out of session, but basketball season must go on! The HS Lady Wildcats will travel to Stockton this evening to face off with the Tigers. Game time: 6:00pm. Get your blue on and come cheer for our student athletes! It's GAME DAY! 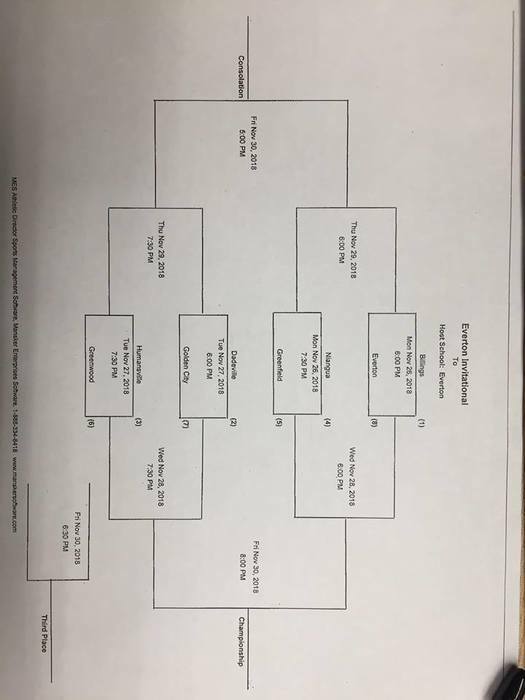 The HS Girls will be playing in the 2nd Round of the Stockton Tournament where they will face off with the tournaments hometown team. Come out and cheer on our Lady Wildcats as they take on the Tigers. Game time: 5:45pm. The JH Boys will be hosting the Miller Cardinals this evening. Game time: 5:30pm. It's GAME DAY! 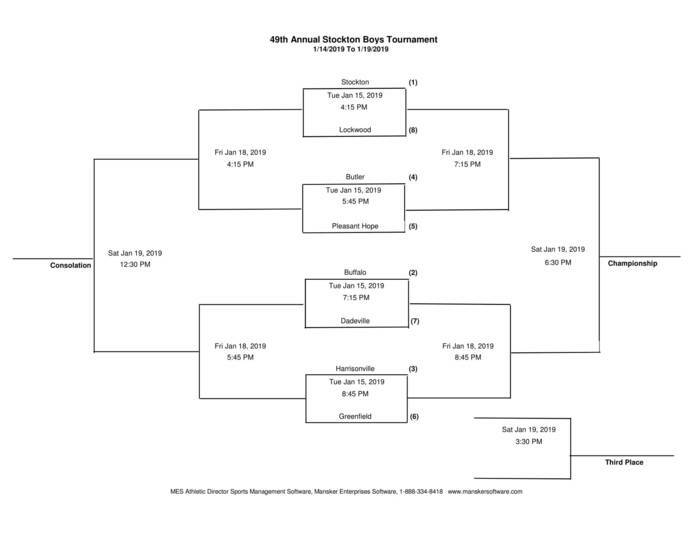 The High School boys will be taking on the Wildcats from Harrisonville in the first round of the Stockton Tournament this evening. Game time: 8:45pm. The JH Boys are traveling to Lockwood to face off with the Tigers. Game time: 5:30pm. Good luck, boys! As the Golden City Tournament is wrapping up, we begin looking ahead to next week. Both the boys and girls basketball teams will be participating in the Stockton Tournament beginning 1/14/19. Check out the brackets and come support our kids in blue! 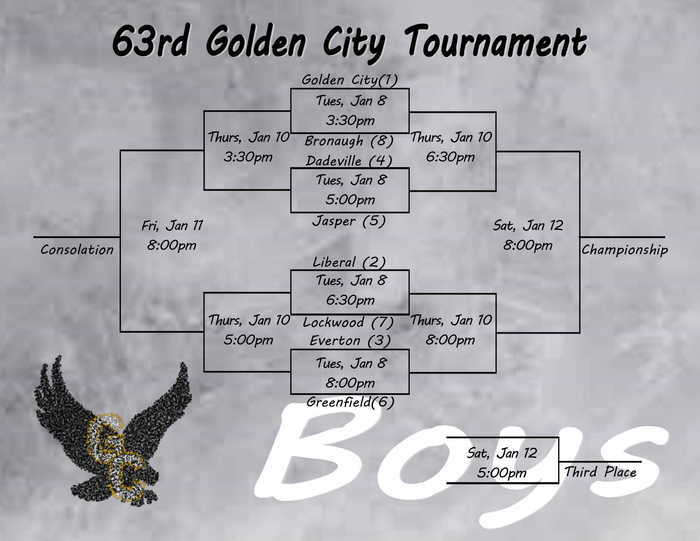 Looking ahead, the Girls and Boys Basketball Teams will be playing in the Golden City Invitational beginning on Monday, 1/7. Please see below for brackets. GO BIG BLUE! The Greenfield R-IV School District hopes that all of our students and community members are enjoying the holiday season. As we look forward to the new year, remember that school will return to session Wednesday, January 2nd. Happy Holidays! Ho Ho Ho! Things are off to a jolly start this morning, as we are in the final stretch before Christmas Break. ***REMINDER: Today is an early out day. The Elementary will dismiss at 1:00pm with the High School to follow. School will return to session Wednesday, January 2nd. 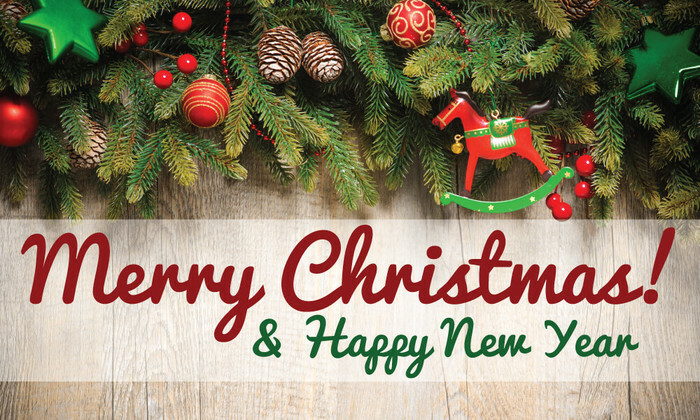 *** Greenfield R-IV School District is wishing our students and community a Merry Christmas and a Happy New Year! Be safe and enjoy holiday break! It's GAME DAY! Varsity Boys and Girls will be hitting the road to face off with the Jasper Eagles this evening. Game order: JV Boys, Varsity Girls, Varsity Boys Game Time: 5:30pm The Junior High Boys will be hosting the Stockton Tigers tonight for their second game of the season. Game Time: 5:30 GO BIG BLUE! It's GAME DAY! Junior High Boys Basketball will play tonight against El Dorado Springs, at Greenfield. Game time is 5:30 pm. Go Wildcats! It's GAME DAY! Girls and Boys Basketball teams will be hosting the Marion C. Early Panthers this evening! Game order: JV Boys, Varsity Girls, Varsity Boys. Games begin at 5:30pm. GO BIG BLUE! 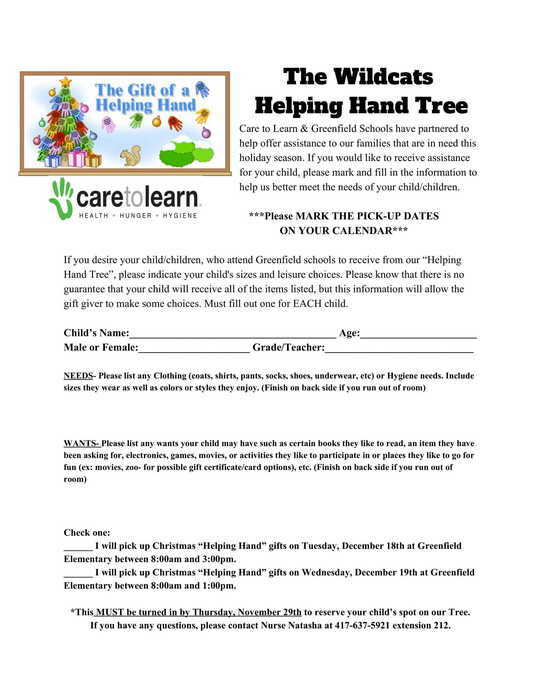 Reminder; the Greenfield R-IV School District will release early on Friday, December 7th at 1:00 pm. Elementary School students will begin releasing at 1:00 pm and JH/HS students will be released once buses arrive from the Elementary School. It's GAME DAY! High School Boys will play tonight against Stockton, at Stockton. Game time is 6:00 pm. The Junior High Girls will play at home against Joplin. Game time is 5:30 pm. Go Wildcats! Come out tonight to see our Elementary School students perform in their annual Christmas concert. The event will be held in the high school gym. Doors open at 6:00 pm and the concert begins at 7:00 pm. Come out tonight to support both varsity basketball teams. 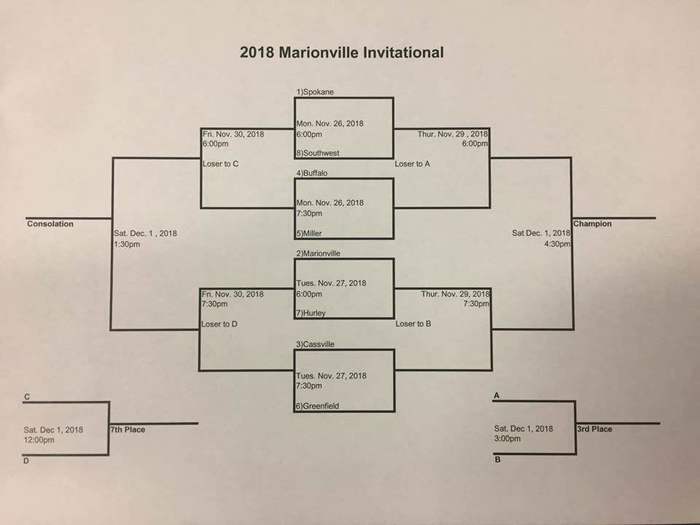 The boys will play in the second round of the Marionville Tournament against Hurley at 7:30 pm and the girls will play for first place in the Everton Tournament against Dadeville at 8:00 pm. Go Wildcats! 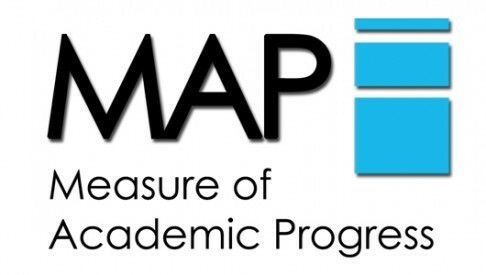 Missouri Assessment Program test scores have been received and will be sent home with students Monday, December 3rd. 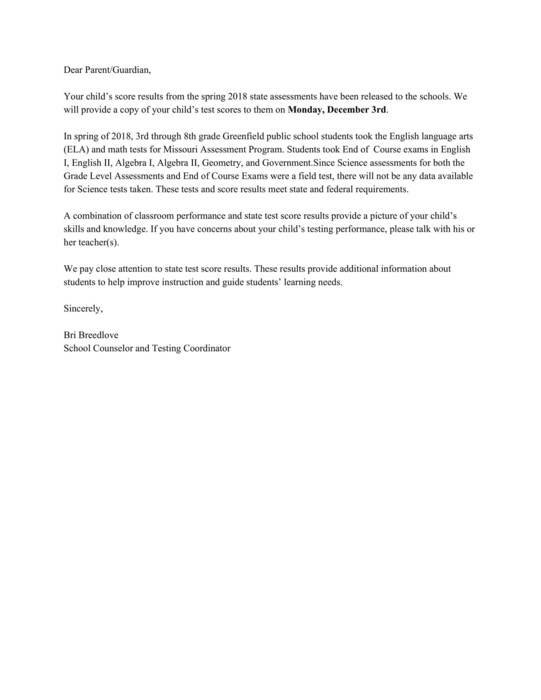 Please see Counselor Breedlove's attached letter to parents. Come out and get in the holiday spirit supporting our Band, Choir, and Art students! It's GAME DAY! The Lady Wildcats will hitting the road this evening to take on Niangua in the first round of the Everton Tournament. Game time: 7:30pm. GO BIG BLUE! It's GAME DAY! Varsity Boys and Girls will be hosting the Everton Tigers tonight for the first home game of the season. Games will begin at 5:00pm and play order will be as follows: Varsity Girls, Varsity Boys, 2 quarters JV Boys. The Junior High girls will be hosting Ash Grove tonight at the Elementary Gym. Game time: 5:30pm. Come out and support our student athletes! GO BLUE! It's GAME DAY! 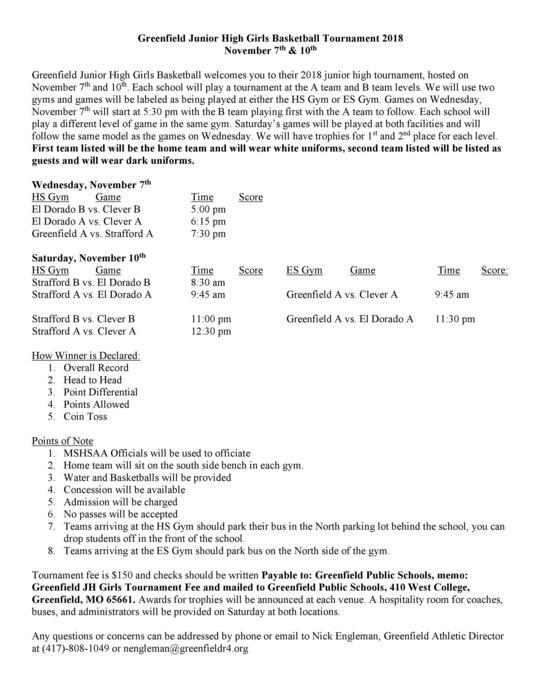 Junior High Girls Basketball will be hosting their 2nd annual Greenfield Tournament beginning this evening. Come out and cheer our JH Lady Wildcats on as they take on the Strafford Indians! Game time: 7:30pm @ the HS Gym. Reminder; the Greenfield R-IV School District will release early on Friday, November 9th at 1:00 pm. Elementary School students will begin releasing at 1:00 pm and JH/HS students will be released once buses arrive from the Elementary School. It's GAME DAY! Our Wildcat Football team will be hosting the Liberal Bulldogs for the district semi-final game. Game time: 7:00pm. Be sure to wear your wildcat gear and come support our student athletes! GO BIG BLUE! It's GAME DAY! The Junior High Lady Wildcat basketball team will be hosting Skyline tonight for the opening game of the season. Game time: 5:30pm. Come out and support our junior high athletes! It's District GAME DAY! Our Wildcat Football team will play in the first round of districts this evening! The Wildcats will be hosting the Appleton City Bulldogs. Game time: 7:00pm. Gate Admission: $4 for adults & $2 for students. GO BIG BLUE! 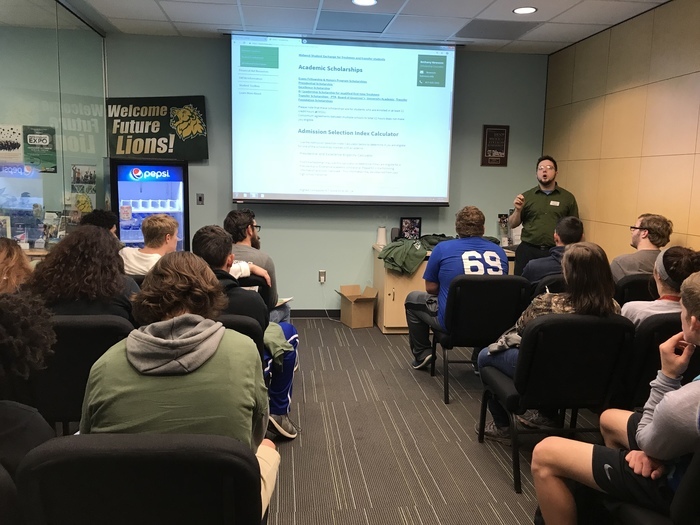 Junior and Senior students had the opportunity to visit and tour Missouri Southern State University yesterday. 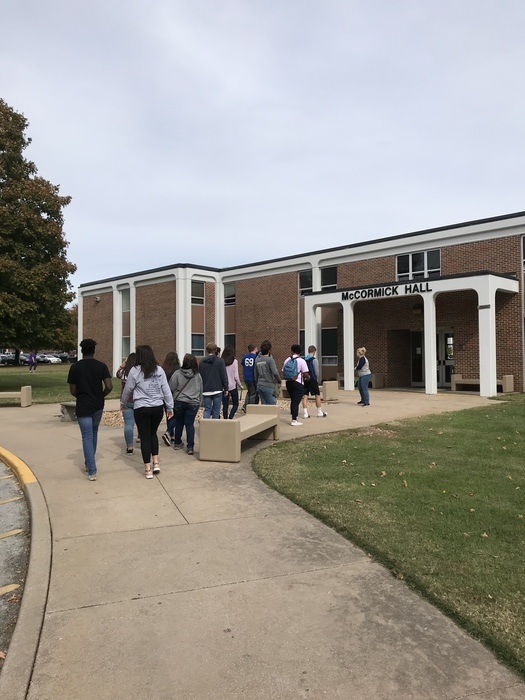 Several students took advantage and spent the day on campus learning about admissions, classes, and the life of a college student. Way to prepare for the future, kids! The C.A.R.E. Mobile is coming soon! 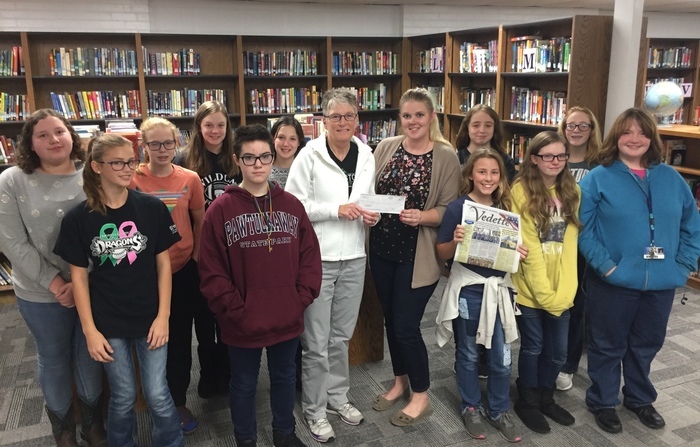 Gina Langston of the Greenfield Vedette presents Ms. Kramer and the 7th grade girls reading class with a check for the Library. This donation will be used to purchase comfortable chairs for our student/readers! It's GAME DAY! Varsity Wildcat Football will be facing off against Stockton tonight! Game Time: 7:00 pm at Stockton. Thursday, October 18th, the Greenfield R-IV School District will release early for Parent Teacher Conferences. The Elementary School will release first at 1:00 pm, followed by the JH/HS. Parent Teacher Conferences will begin at 1:30 pm and end at 6:30 pm. No School Friday. A representative from MIZZOU is presenting this morning to our Junior and Senior students. 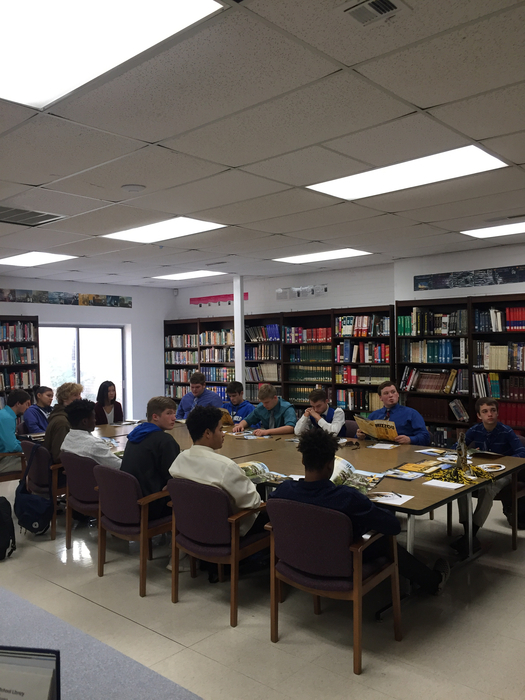 Mrs. Breedlove has implemented “College Wednesdays” this year and has had a great turnout thus far. It’s exciting to see so many students looking to further their education! It's GAME DAY! Varsity Wildcat Football will be facing off with rival the Lockwood Tigers tonight! This is the first time in four years we have faced off with the Tigers. Wear your Wildcat gear and come cheer on our student athletes. Game Time: 7:00pm. GO BIG BLUE! Picture Retakes will be on Wednesday, October 24th. 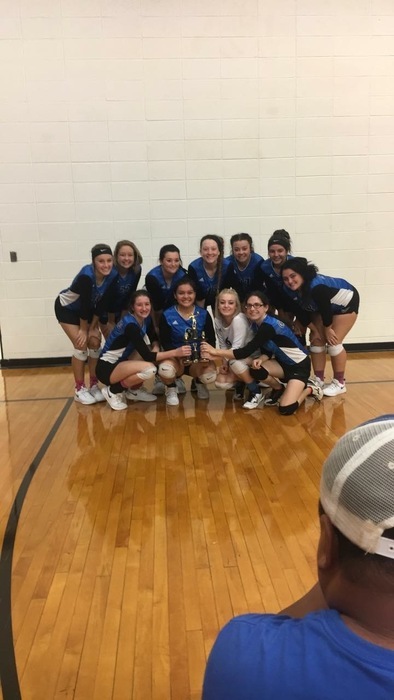 Congratulations to the Varsity Lady Wildcats on earning the Consolation Trophy at the Pleasant Hope Tournament today! What a great day for Wildcat Volleyball! 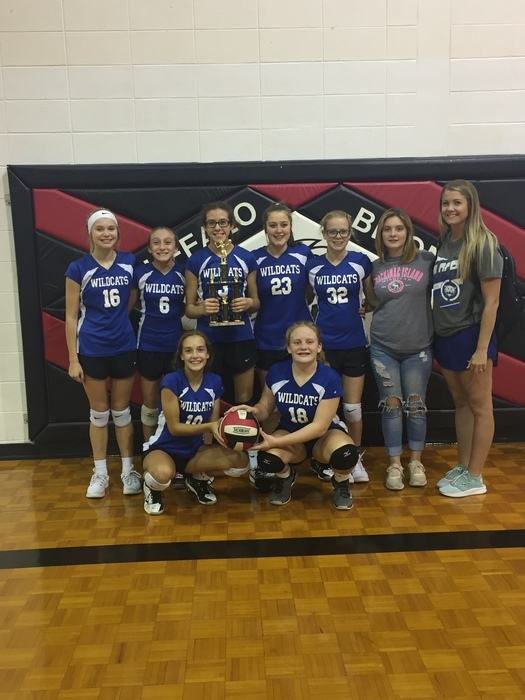 Congratulations to the JH Lady Wildcats on placing 3rd in the Buffalo Tournament! These girls split with Willard and Clever and defeated Bolivar for the 3rd place game. Way to go girls! Reminder: Community Blood Center of the Ozarks is set up in the HS Gym today, 10/1, from 9:00am - 2:00pm. This blood drive is open to the community. If you wish to donate, photo identification is required and please eat well and drink plenty of fluids prior to arrival. It's GAME DAY! Junior High Football will be hosting the Jasper Eagles. Game time: 5:00pm. Junior High Volleyball will be hosting the Marionville Comets. Game time: 5:30pm. Come catch a game and support our athletes! 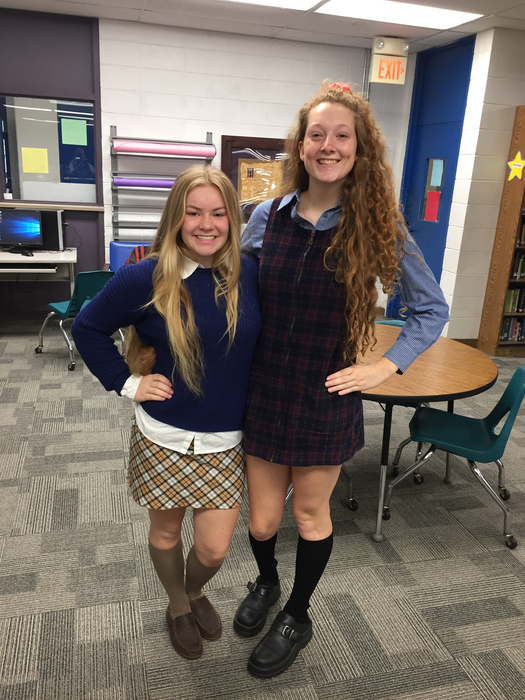 It’s HOMECOMING DAY! The homecoming parade starts at 1pm and will set off on the same town route as last year. Tailgating at the football field begins at 4:30pm. There will be lots of food and goodies so come hungry! Queen coronation begins at 6:30pm. And last but certainly not least, our Varsity Wildcats will be sinking the Pleasant Hope Pirates at 7:00pm! It will be a fun evening, so come out and support our student athletes! #SinkthePirates - GO BIG BLUE! Final Reminder: Thursday, Sept. 27th, there will be an Early Childhood Celebration at the Lockwood Methodist Church. Families with children ages 3-5, are invited to to meet your school district's PAT and Cooperative Staff. The fun begins at 5:00 pm and lasts until 7:00 pm. REMINDER: There will be webinar tonight, titled "Applying to College: What You Need to Know Right Now." The panel will cover the college application process from start to finish, and both students and parents are invited. Starts a little before 6pm in Mr. Teel's room. Parents and patrons attending tonight's JH volleyball game: The west side of the church parking lot will be reserved tonight for an event. Please plan accordingly. Thank you! It's GAME DAY! Varsity volleyball will be traveling to Liberal to face off with the Bulldogs. There is NO JV game. Game time: 6:00pm. JH volleyball is hosting the Strafford Indians tonight. Game time: 5:30pm. Junior Varsity football will be traveling to Sarcoxie. Game time: 6:00. It's GAME DAY! Varsity Football will be traveling to Sarcoxie to face off with the bears. Game time: 7:00pm. GO BIG BLUE! One final reminder, the Greenfield R-IV School District will release early on Friday, September 21 at 1:00 pm. Elementary School students will begin releasing at 1:00 pm and JH/HS students will be released once buses arrive from the Elementary School. It's volleyball GAME DAY! Varsity teams will be hosting the Exeter Tigers this evening. Game time: 6:00pm. Junior High will be traveling to Skyline to face off with the Tigers. Game time: 5:30pm. GO BLUE!
! !Homecoming Week Yearbook Sale!! September 23 - 28, yearbooks will be on sale for $35. (regular price: $45) Don't miss out on these great savings! REMINDER: There is a Senior Parent Meeting this evening, 9/18, at 5:30p.m. The meeting will be held at the High School. Parents you are strongly encouraged to attend! See you there! Please remember that the Greenfield R-IV School District will be releasing early on Friday, September 21 at 1:00 pm for an afternoon of teacher professional development. It's GAME DAY! Varsity Volleyball will be hosting the Jasper Eagles this evening. Game time: 6:00pm. JH Volleyball will be hosting Bolivar in the new elementary gym. Game time: 5:30pm. JH Football will be traveling to Skyline. Game time: 5:30pm. GO BIG BLUE! JV Football will be hosting the Marionville Comets this evening. Game time: 6:00pm. Let's go boys! FCCLA officers and senior leaders are in Carthage today attending leadership training. The students of today are the leaders of tomorrow. Way to go, kids! It's GAME DAY! The JH Football team will be hosting Stockton tonight at 5:30 pm and the HS Volleyball team will be hosting Lamar at 6:00 pm. Come out, wear your Wildcat gear, and cheer on our student athletes! It's GAME DAY! 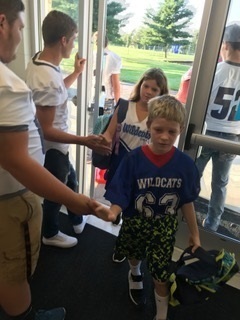 The Wildcat Football team will be hosting the Forsyth Panthers tonight for the first home game of the season. Come out, wear your Wildcat gear, and cheer on our boys! Game time: 7:00pm. GO BIG BLUE! It's volleyball GAME DAY! Varsity and JV teams will be traveling to Stockton to face off with the Tigers this evening. Game time: 6:00pm. The Junior High Lady Wildcats will be hosting the Pleasant Hope Pirates this evening for the first game of the season. Game time: 5:30pm. It's GAME DAY! Our Junior Varsity Football team will be traveling to Jasper this evening. Game time: 6:30 pm. The team bus will leave from the football field at 5:00 pm. It's volleyball GAME DAY! The Lady Wildcats will be hosting the Everton Tigers tonight. Varsity will be playing first, followed by JV. Game time: 6:00pm. 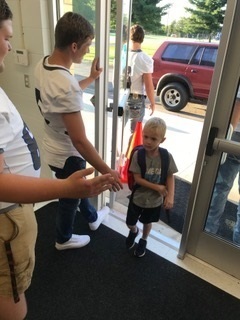 Greenfield football players welcoming elementary students to school on game day! It's GAME DAY! Our Wildcat Football team will be traveling to Osceola this evening to face off with the Indians. Game time: 7:00pm. GO BIG BLUE! It's volleyball GAME DAY! The Lady Wildcats host Ash Grove tonight. Game time: 6:00pm. Come out and support our student athletes! That's a WIN! Congratulations Lady Wildcats! JV and Varsity teams defeated Thomas Jefferson in the first home game of the season! Please remember that the Greenfield R-IV School District will be releasing early on Friday, August 31 at 1:00 pm for an afternoon of teacher professional development. There will be no school Monday, September 3rd due to Labor Day. Greenfield defeats Liberal 22-8 to begin the new football season. Go Wildcats! 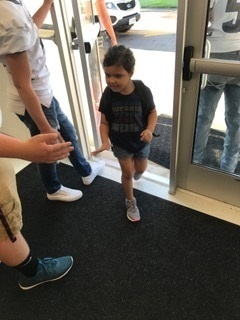 What a great start to the 2018-19 school year. Thank you parents and teachers for allowing our year to start out so well!